Call Now - We're Open! Watch or record up to 16 HD channels at once! *Voice Remote: Requires internet-connected Hopper. Simplify your HD TV experience. The Hopper provides a way to unify your DVR content in one location, using up to 6 Joeys to control your Hopper DVR from any TV in your home. If Primetime Anytime™ is enabled, you can record all of the big 4 networks (ABC, CBS, NBC and FOX) as well as 2 other channels at once. The Hopper includes a 2 Terabyte hard drive to store your DVR content - up to 250 hours of HD Movies and Shows, as well as a library of on-demand content for instant viewing. 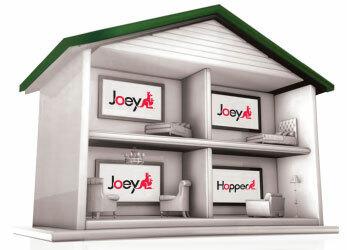 With the Hopper and Joey, connect up to 7 TVs with 1 Hopper and 6 Joeys. Ability to stream Bluetooth audio with Dolby Digital support. Record up to 16 Shows at once. Clashing TV showtimes, or families that clash over TV shows, mean that sometimes you have to chose between recording your kid’s shows or yours. Record many shows simultaneously using the Hopper 3.